The University of Wisconsin–Madison concluded its “Year of the Wisconsin Idea” last spring with the installation of a cast bronze plaque—a gift from the Class of 2012—to honor this long standing campus tradition of service to the state. After a year of programming tied to this theme, I found myself contemplating how the Wisconsin Idea has influenced my work as a UW–Madison employee and, more importantly, how it might guide me in the future. But this proved more difficult than I anticipated. Although the Wisconsin Idea is a casually used phrase on campus, it’s not always fully understood. For me, I felt like I was missing the greater historical context of the Wisconsin Idea and a sense of what it means to people outside of Madison and beyond the UW System. Many have misattributed this maxim to Charles Van Hise, president of the University of Wisconsin from 1903–1918. However, Van Hise did say in 1904 that he “shall never be content until the beneficent influence of the University reaches every family in the state.” This phrase seems to extend the realm of influence of the Wisconsin Idea beyond legislation to encompass a more direct influence on many other aspects of Wisconsinites’ lives—and perhaps a broader ideal toward which we can all aspire. Whatever its definition and scope, which can vary depending upon who you ask and where, there seems to be general acknowledgment that the main thrust of the Wisconsin Idea is that the research and expertise of the university—whether UW–Madison, UW Extension, or any UW System campus—should be put to work for the people of the state, if not the nation and the world. In late spring of 2012, part two of my Wisconsin Idea education took place in the form of the Wisconsin Idea Seminar. Sponsored by the Graduate School at UW–Madison, the Wisconsin Idea Seminar is a five-day bus tour for forty faculty and staff to a wide variety of sites across the state to see the Wisconsin Idea in action. Funded by the Evjue Foundation, the seminar has since 1985 provided its participants, many of them brand new to the UW– Madison, with a better sense of the people of our state: their lives, work, the ways in which UW–Madison influences them—and the ways in which they influence the university. While the Wisconsin Idea is a quintessentially Wisconsin notion, the concept for the seminar trip actually came from another state university. “At a professional conference in the 1980’s, the Vice Chancellor for Outreach Development was talking with his counterpart at the University of Georgia about their ‘New Faculty Tour’, which began in 1977. Inspired by University of Georgia’s success, UW–Madison began their own program under the direction of Peg Geisler in 1985 to introduce and promote the Wisconsin Idea to new faculty by highlighting the work of the university around the state and reinforcing the importance of public service at a land-grant institution,” says Miriam Simmons, a former assistant dean of the UW–Madison Graduate School who directed the program from 1993 until she retired in the summer of 2012. “The seminar sites chosen each year represent the state’s educational, economic, social, and political activities: a dairy farm, correctional institution, two- or four-year UW System schools, a business or industry, a Native American tribe, and a Milwaukee Public School are always featured,” she notes. Some of the Wisconsin Idea Seminar participants are Wisconsin natives like myself. Others hail from across the United States and points beyond—Belgium, Canada, China, England, Madagascar, Puerto Rico, Russia—and their backgrounds run the gamut of academic fields: agriculture, art, education, engineering, geography, journalism, mathematics, music, philosophy, political science, and veterinary medicine, to name a few. They were all nominated by their department chair or director and ultimately selected by their dean. Stops on my 2012 Wisconsin Idea Seminar tour, which was held in late May, spanned 600 miles throughout the eastern half of Wisconsin, from as far north as Marinette to Milwaukee in the south. What follows are one traveler’s insights and observations from just a few of these visits. In the midst of three hundred acres of conifer, hardwoods, and prairie stands the Aldo Leopold shack, a chicken coop transformed into a cabin by Wisconsin’s most renowned conservationist and his family. The remoteness and quiet of this place, now lovingly maintained by the Aldo Leopold Foundation, lets our group of campus-dwellers listen to springtime in the wilderness— the daytime conversations of crickets and the chirps of city-shy birds. A short walk from the shack, the water laps softly on the sandy banks of the Wisconsin River. But underlying the murmur of spring seems to be a prolonged sigh. The breeze plays with the tops of the tall grass and sets the purple clusters of knee-high lupine to swaying. It breathes its relief lightly across our ears, seemingly content that the snow is long gone and the mud and rain have left behind blossoms and green. It’s a wonderful place to begin this journey, not only because of its peace and beauty, but also because it stands as a legacy of Leopold’s work, which very much embodies the Wisconsin Idea. He bought the plot, originally eighty acres, to serve as a living lab in which he could discover the best ways to maintain the land and then educate farmers and landowners on how they might do the same. This grand experiment in conservation continues today with the stewardship and outreach efforts of the Leopold Center. When we leave the shack, we do so a tad sunburned and mosquito bitten, but also a little more at peace and a little more aware. Our long journey Tuesday takes us from Blue Sky Green Field Wind Energy Center, a wind farm in northern Fond du Lac County with 88 turbines capable of generating enough electricity to power 36,000 homes, east to Lake Michigan and the UW–Manitowoc campus, and then on up to Green Bay’s Lambeau Field. On the bus rides between visits we hear from a host of guest speakers. Jerry Murphy, executive director of New North, teaches us about economic development in northern Wisconsin; Professor Joe Salmons of UW–Madison covers the history of the state’s German immigrants; and David Bell, assistant professor of kinesiology at UW–Madison, offers insight into concussions and youth athletics. Each speaker ties his topic to UW–Madison’s research and service. Time passes quickly and we find ourselves motoring further north toward Keshena, home of the Menominee Indian Tribe of Wisconsin, where Karen Washinawatok, Director of the Language and Culture Commission of the Menominee Nation, and UW–Madison professor of linguistics Monica Macaulay explain the precarious state of native languages: Of an estimated 300 languages spoken in North America before Europeans arrived, perhaps a hundred are spoken today, and twenty-five of those are known to only a handful of elders. “Even though we know we must learn English, that we must master that language, we see learning our native language as our personal responsibility,” she says. In fact, the tribal schools work tirelessly to preserve the Menom- inee culture and language among their youth. Fortunately, this is where UW has been able to help. Macaulay has collaborated with the tribe in developing dictionaries of the Menominee language, and she works with their teachers on methods for using them in the classroom. “But I’m not the one who’s saving the language: the community is,” says Macaulay. She says this work appeals to her much more than the “helicopter model” of research she encountered in her doctoral training, in which researchers swoop in, hover for a while as they gather data, and then take off just as swiftly. Washinawatok tells us this approach has been used in the past to the detriment of the tribe. Much of the research has been inaccurate or misleading, she says, which is why her commission monitors research by non-natives and protects the intellectual property rights of the tribe. I am left feeling that the relationship between the Menominee Nation and the university is as precarious as that of the Menominee language and culture. But I am heartened by the Nation’s resolve and the fact that UW–Madison faculty and staff like Macaulay can continue to help by approaching research as a partnership with the community. The towering steel cranes and concrete slabs of the production yard of Marinette Marine stand in stark contrast to the turn-of-the-century brick buildings and immaculate greenspaces of the UW–Madison campus. Still, these two places share a strong connection. In constructing combat ships for the U.S. Navy, the Marinette Marine Corporation uses friction-stir welding, which creates fewer distortions and seams than traditional fusion welding. This is vital to combat ships because smooth welds make for stealthier vessels that can slip through radar undetected. Friction-stir welding has been around for about as long as blacksmithing in general, but researchers in the School of Engineering at UW–Madison have developed improvements, including the use of robotics and advanced techniques for monitoring and controlling weld temperature, that make it a cost-saving process for Marinette Marine. I was proud to see a Wisconsin company thriving in part because of UW–Madison research. However, I can’t help but wonder how well this connection is known or how much it would really matter to most people in Wisconsin. I continue to ponder the somewhat behind-the-scenes connection between the UW–Madison and Marinette Marine as the other faculty and I line up on one side of a chain-link fence, awaiting our hard hats, earplugs, and goggles before we enter the factory. On the other side of the fence, workers stream through a turn style leading out of the factory. They chat and joke around amiably, only to stop when someone mentions to them that we’re a tour group from the university. Later, as we pass a welding crew crouched over a sheet of steel, a young man smiles at us through the sparks and says, “I feel like I’m in a zoo!” We share a laugh and a few group members wave back somewhat apologetically. Stephen Young, an assis- tant professor of geography from Manchester, England, turns to a few of us and says he feels like an intruder. But there is tangible value in stepping outside of our comfort zones. Seeing this massive undertaking up close—soaking in the heat of a nearby welding torch and skimming our fingers across the smooth steel hull of a massive research vessel as we pass beneath it—helps us truly appreciate the importance of this plant to its workers, the larger community around Marinette, and the world. Great Lakes Kraut Company is another industry that has prospered from UW’s involvement. Plant pathologists at UW–Madison and UW–Extension have long used their research to help farmers and vegetable growers control disease in their crops. In 2010, spring flooding led to an outbreak of black rot in Outagamie County, which caused a cabbage shortage. Amanda Gevens, an assistant professor of plant pathology, helped Great Lakes Kraut reestablish production in Florida where the crop was re-planted in May and harvested late in the summer to ensure production quotas were met. After seeing this company thriving first-hand, in part because of the university, I sense a bit of pride among our group, and it seems matched by Downs and his son, Ryan, who are both UW–Madison alumni. 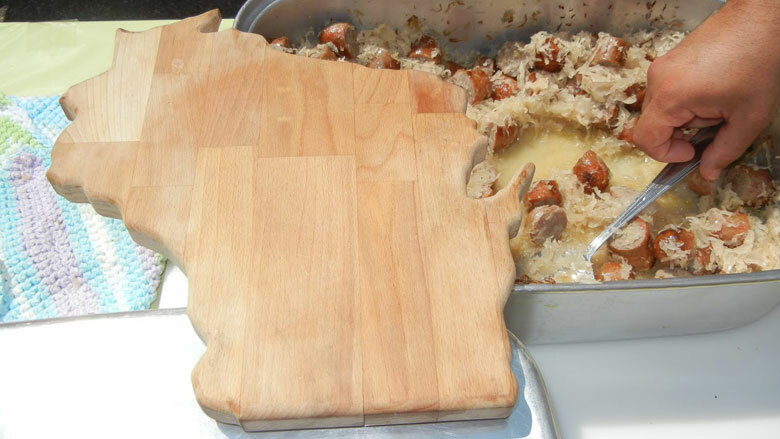 And I can only assume there are thousands of Wisconsinites across the state—especially those of German stock—who are more than pleased their seemingly insatiable appetite for kraut was met despite the setback. At the end of our last day, we’re left with a few moments to think back on everything we’ve encountered in the past five days and share what we will take away from the tour. The vignettes I’ve recorded barely scratch the surface of our experience as both individuals and as a group, which would require a book for a full retelling. But listening to seminar participants reflect on the trip reveals a plurality of perspectives. For participants who are Wisconsin natives or long-time residents, the exploration beyond campus strengthened their understanding of and connection to the state. Katy Culver, an assistant professor of journalism, is a Wisconsin native and forty-four-year resident. Still, she says, “Ninety percent of what I heard this week I had never known before.” And music professor Stephanie Jutt, a native Californian but a twenty-year resident of the state, explains that she has never felt like she truly lived in Wisconsin until now. The seminar draws a raw emotional response from others. As assistant professor Nancy Kendall speaks about the student experience in Milwaukee and our visit to Redgranite Correctional Facility, tears well up in her eyes. She is grateful to have been exposed to some of the hardships of these places and feels more determined to make her work as an assistant professor of educational policy studies apply to Wisconsin’s challenges. “I think this trip has made me a revolutionary,” she says. Personally, I am struck most by the raw curiosity of my traveling companions. They posed countless questions about topics well beyond their respective fields and assumed range of interest, and (perhaps more important) they listened intently—behaviors that defy the stereotype of the insulated academic. These qualities— the desire and ability to listen—are critical if the Wisconsin Idea is to continue to evolve into a true partnership between the UW and the citizens of the state. The people I met on this journey, both my campus colleagues and my fellow Wisconsinites, made me believe this is possible. Nik Hawkins is assistant director for communications at the Wisconsin Center for the Advancement of Postsecondary Education (WISCAPE) at UW-Madison.